Last week we saw BWX, BKL, A2M, WTC, NCK, NAN and BIN all up 7% or more. BAL is up 85% in three months, A2M is up 83%, WTC is up 55%, BWX is up 28%, BLA is up 46%. The mid-cap sector is having a dream rally. A lot of illiquid stocks here, let’s hope it continues because trying to get out when it turns is going to be a nightmare for some of the bigger fund managers. Here is a chart of the mid/small cap recovery showing the seismic collapse last October after the TPG Telecom profit warning wiped $5bn from its market cap triggering a rash of mid-cap selling. For now, it’s all back on. 1) The risk appetite of investors which will generally improve the higher the market rises. 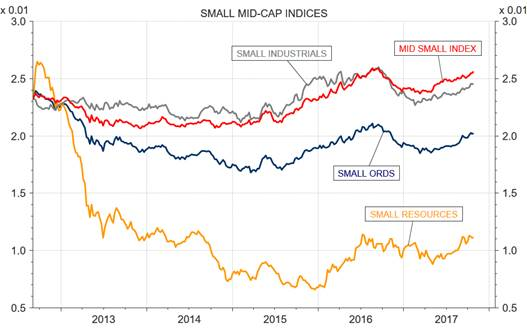 Small caps are fashionable in the good times as risk aversion fades. On the flip side, it is a sector that will be quickly deserted in bad times. 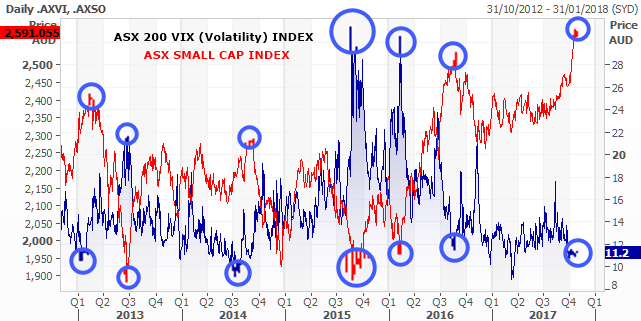 This is the chart of the ASX 200 VIX or volatility index compared to the ASX Small Ordinaries index. They are inversely correlated. When it comes to correlation, you are looking at the alignment of the turning points not the magnitude of the charts. I have marked on some of the coincident high and low turning points. It’s a quite phenomenal chart in its correlations. And as you can see the small ordinaries sector is absolutely on a rip right now, as the market’s risk aversion (as measured by the lack of volatility) falls to near record lows. 2) The other driver of the small-cap sector is seismic events. Like the TPG Telecom profit warning last year, which knocked $5bn off its market cap, destroyed Vocus (another market darling at the time), and triggered a rash of mid-cap selling as performance faltered, clients exited small funds, the money pulled out, and everything went down with it. You will notice that all mid-cap fund managers had a shabby last Q of last year. The only defence was cash, but in a sector that lacks liquidity, cash is hard to raise. In the end, fund managers were trapped in their stocks and simply had to rise it out. You must watch out for the contagion of large mid-cap failures on the rest of the sector. For instance, if A2M had a profit warning, you have to consider selling everything else. If a sector of very diverse stocks can trend as a group, it tells you that you cannot just look at individual stocks in the small (or big) end of the market. Sometimes you can miss the wood for the trees. The wood (the mid-cap sector) can sometimes move and trend and catch all stocks (the trees). You have to be aware of the trend…be aware of the chart above. At the moment mid-cap sentiment rides high as the market rises. Risk aversion is low. The obvious implication, especially after such a hot week in small caps is that we are setting up for a sell-off. No reason other than ‘mean reversion’ (what goes up generally comes down) and there is little sign of it happening yet. But it will only take one sizeable fund manager in the space to decide to run cash up to kill the mood for all small stocks. Marcus Padley is the author of the Marcus Today stock market newsletter. To sign up for a 14-day free trial please click here. I normally really appreciate your work Marcus, but this article is disappointing. The whole market is inversely correlated with the VIX index, not just the mid cap sector. It's flawed to view the VIX can be used as a signal for an impending small-cap selloff. We could look at the Top 20 or Top 50 index against the VIX and draw a conclusion that we are due a selloff in large caps rather than small or mid caps. We could even find some data points to support that and say that the inverse relationship between the Top 50 and the VIX is substantially stronger than between Mid Cap index and the VIX (correlation of approx. -0.53 compared to -0.15). The data simply doesn't support that the VIX can be used as a signal for any potential sell-down in small or mid-cap stocks. In fact, if we look at the Outperformance of small caps against large cap stocks (over rolling 3 month period), this has a positive correlation with the VIX index. That is, Small caps have been more likely to outperform large caps when the VIX is rising, not when it is falling. James - I should have put up the small caps relative to the ASX 200 against the VIX - it would make the point better - small caps outperform on a relative basis when the market is more 'comfortable' . The small caps are flying relative to the market now - as Morgan Stanley point out...their PE relative to the large caps is a a premium only seen three times since 2000. Arguments aside - I've just take some (premature?) small cap profits because when this turns...no-one is going to be able to get out. Finger on trigger.